If you enjoy green living and like to do things that are beneficial to the environment, you should consider using a garbage disposal in your kitchen. These food waste disposer units provide a number of great green-living benefits, and are perfect options for people who don’t or can’t compost. Here’s a look into why you should choose a garbage disposal over sending your food waste to the landfill. 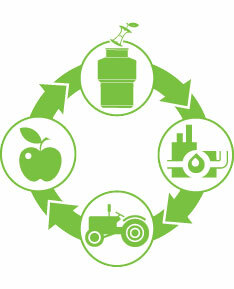 When you choose to throw your food waste into your disposal, it in turn keeps it out of your local landfills. Decomposing food contributes to the number one cause as to why landfills smell atrocious. During the decomposing process, the food waste releases methane gas which contributes to the greenhouse effect and global warming, plus an acidic liquid residue called leachat that can seep into ground water. Instead, when you use a garbage disposal you are pulverizing the food waste into tiny particles which will be passed down the drain into the sewer system which will then be transported to your local water treatment plant. At the water treatment plant, the particles can be separated from the water and used to produce methane gas which will be properly contained to be used as renewable resource to power the plant. It can also take the leftover waste particles and produce fertilizer which can be used by local farms, etc. Each year, the United States alone produces 19 million tons of food waste. If people want to help reduce the greenhouse effect, they need to start using garbage disposals to responsibly transport food waste to a better option. See my in-depth InSinkErator Evolution Septic Assist Review to read about one garbage disposal that is designed to be Eco Friendly. Help save the air in your city or local neighborhood, select a garbage disposal that will aid in keeping harmful gases out of our air, and harmful residues and chemicals out of our water supply.